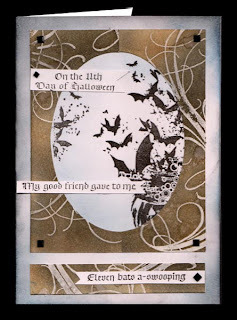 I was going to make a fall card... but when I was looking through my paper stash I came across a background I had done using the Quietfire Design Flourishes and thought to myself let's make a Halloween card - we're only 6 weeks away from it BIG GRIN. The background was a resist technique that I love, stamping with Perfect Medium, clear embossing, spraying and sponging Distress browns, drying and then ironing off the clear embossing. The background already had a big oval cut out from it, which was too big for my card, so I sliced it in half and overlapped the two cuts to create a smaller sized oval which I cut with the smallest die from Spellbinders Grand Ovals. I then sliced it again, removing the overlap pieces and glued the two halves together. I even had a small piece left over for that bottom strip. The card is side folded 5"w x 7"h. Stamped the bat image (Inkadinkado "Happy Haunting") with Versafine Black Onyx and clear embossed. Sponged Black Soot around the edges of the white card, then some Faded Jeans, bringing the blue into the oval section as well. Adhered my oval background, trimmed down the rectangle piece and adhered that. Stamped the various word elements (Quietfire Design) on white cardstock, trimmed them down, cutting a picot edge on them and adhering them to the card, adding small and medium square black rhinestones. I found the oval a bit bare, so stamped a portion of the bat image on the left side. Very cool looking. Love the design. Thanks for joining Speedy Fox and Friends. I love what you did with this Halloween card. I love the colors and layout. Thanks for playing along with us at Tuesday Throwdown. Love the swirly paper with the bats! Very nice look. thanks for sharing with us at TT. Whoa ho ho! I *love* this!!! What a spooky fun card! Thanks so much for playin' along with us this week at Shelly's Images. We hope you'll join us again this week and play along! Thank you so much for joining in on our I Believe I can Fly challenge over at Raise The Bar!